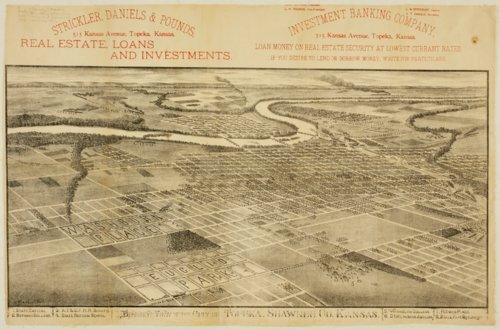 Tlhis lithograph is a bird's eye view of Topeka, Shawnee County, Kansas. It is an advertisement for the sale of land by Strickler, Daniels, & Pounds, real estate, loans, and investments and by the Investment Banking Company. The same people are involved in both business. Buildings/institutions identified in the legend at the bottom include the State Capitol, Bethany College, the Atchison, Topeka, and Santa Fe Railroad shops, the State Reform School, Washburn College, State Insane Asylum, Potwin Place, and the State Fair Grounds. Some parts of the lithograph show detail on buildings and other are not very distinct. A number of other railroad lines are shown, in addition to AT&SF. The Kansas River runs through the northern portion of Topeka. Two areas, Washburn Place and Euclid Park, are shown and they are possibly real estate developments for the company producing the lithograph.